I've been making pizza for years. In fact, it's kind of what i'm known for. It's definitely my most requested meal. Pizza is not difficult to make, but it does take a little time. I usually make my dough in the morning. It only take about 5 minutes to get it going and then I'm one step ahead. I've made it so often that I don't use a recipe or measure anymore, but I've looked around and found my original recipe to share with you. Add the yeast to the warm water and set aside. You should see the yeast begin to bloom within a couple of minutes. That just means the little granules start to puff up and look spongy. If it doesn't do that, throw it out and start over because your yeast is expired. I make my dough in my food processor because it's so fast, but if you don't have one you can make it by hand or with a mixer. Add the flour and the salt to the bowl of the food processor. This is the time to decide whether you want plain dough or if you'd like to add something to flavor it. Some of the seasonings I use are fresh rosemary, red pepper flakes or parmesan cheese. I decide which one I want based on the type of pizza I'm making. Today you can see I added red pepper flakes. Now put the lid on and pulse it a few times. This will break up the pepper flakes and mix them in evenly. By now your yeast should be ready so add the olive oil to the mixture and give it a little stir to loosen whatever is stuck to the sides. 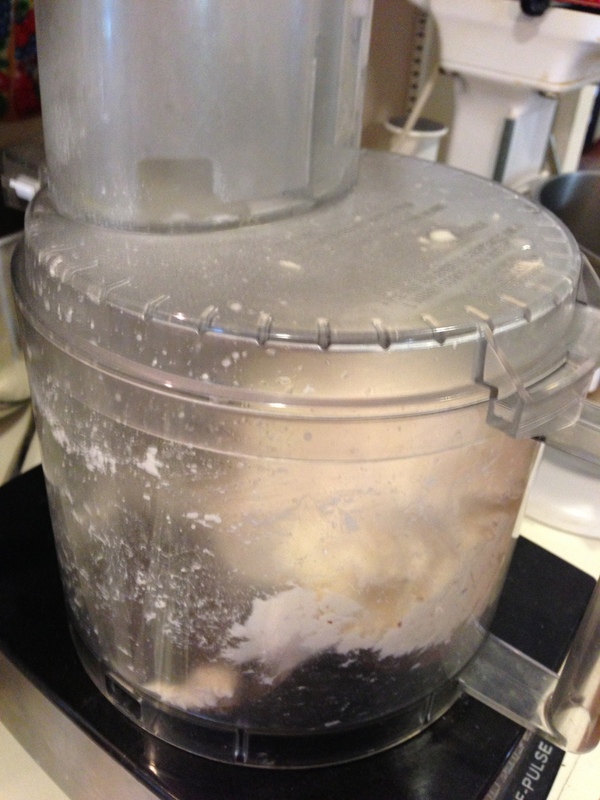 With the food processor running, pour the yeast mixture into the feeding tube. After you've added all of it, get the other 1 1/4 C of water and start slowing adding it until the dough comes together and forms a ball. This is not an exact science. The amount of water can vary each time you make it depending on things like the humidity levels that day. Just be sure to add it slowly and stop as soon as the ball forms. Now let the dough mix for another minute or two and you won't have to knead it when you take it out. The dough will be slightly sticky but manageable. if you added too much water and the dough is gooey, just dump it out on your bread board and sprinkle on more flour and hand mix it in until it can be rolled into a ball and keeps it's shape. 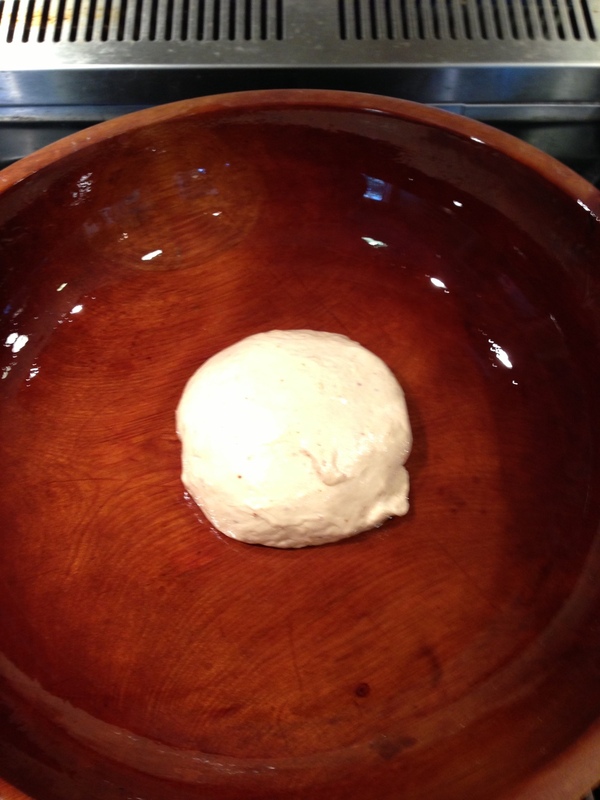 Now put some olive oil into whatever bowl you want to use for the dough to rise. 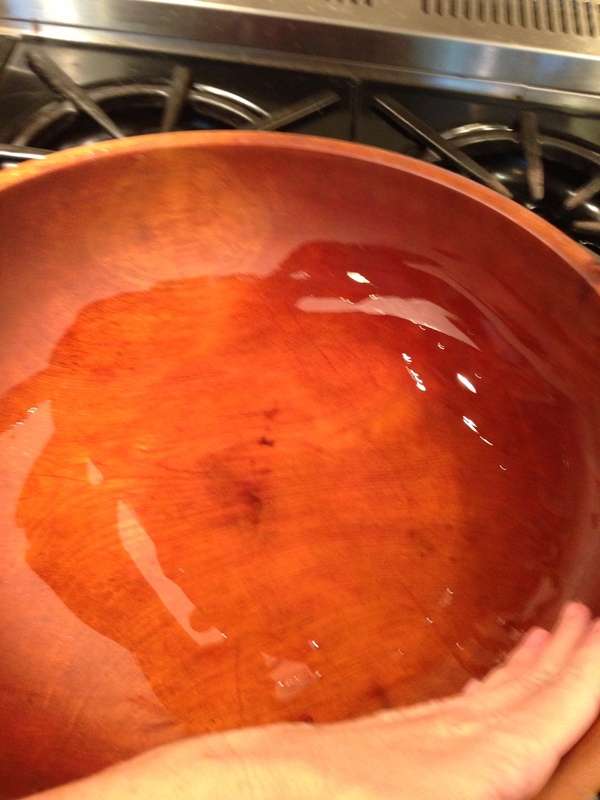 I use an old wooden bowl but you can use glass or metal if that's what you have. Be sure to spread the oil around to cover the entire surface so that the dough doesn't stick when it rises. Now form the dough into a ball and put it in the bowl. Roll it around so that all of it is covered with some of the olive oil so that it doesn't dry out while it's rising. Now cover it with a clean towel or plastic wrap and set it aside for a couple of hours to rise. I use a towel because plastic wrap doesn't stick to my bowl. If you use plastic wrap, spray the side that is towards the dough so that it won't stick. Now you're ready to make pizza. You can see how much the dough has risen. Pinch off the amount you need and roll it out and add toppings and bake. I'll be posting some of our favorite combinations periodically. So how much dough does this recipe make? Well, that depends on how you like it. I'd say it makes 2 large, medium thickness crusts. I usually make 4 smaller pizzas, some thin crust and some thicker with a variety of toppings. so everyone is happy. My only warning is this--once you start making homemade pizza no one is ever going to want to order out again! Posted in In The Kitchen and tagged with pizza dough. October 19, 2012 by Lynn Adams.